Titan Comics: PSYCHO GRAN Review #bestbritcomics | Warped Factor - Words in the Key of Geek. Throughout the month of May Titan Comics are celebrating the Best Of British, with an array of cutting edge talent and bold new visions! 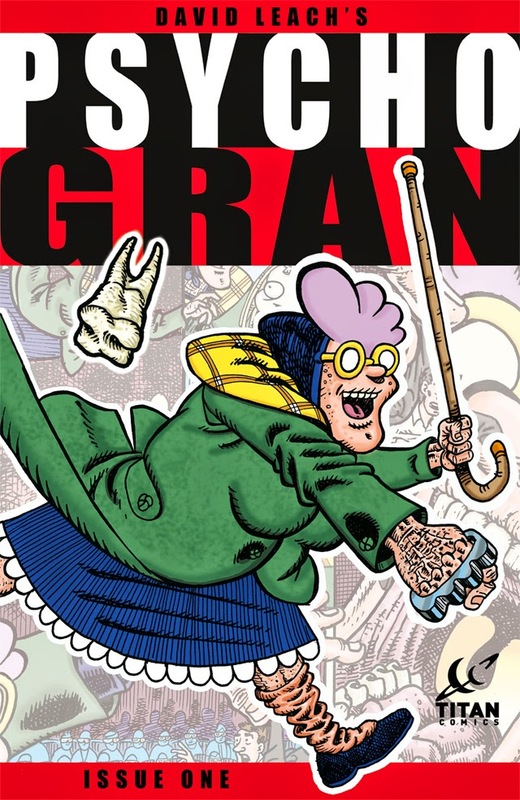 There's a large selection of comic books and graphic novels available, all supported by the #bestbritcomics moniker, including a couple of digital exclusives, one of which is Psycho Gran. First appearing in the cult British kid's comic Oink! 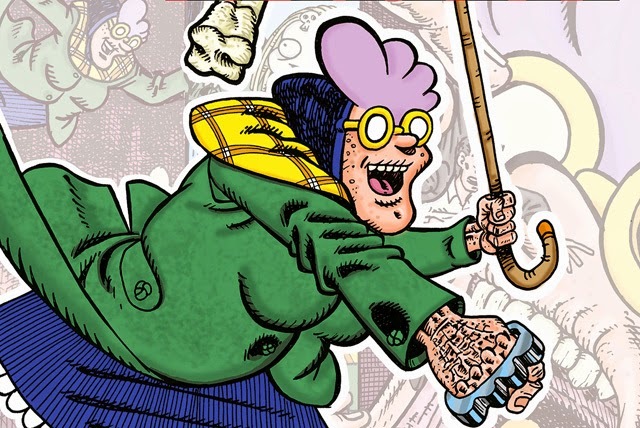 back in 1986, Psycho Gran is a five-foot high, mauve-haired, bespectacled, psychotic granny with a pan-dimensional, sentient handbag called Percy! She's the brain-child of cartoonist and comic book editor, David Leach - editor and writer of the Wallace and Gromit newspaper strip and the Adventure Time comic magazine. Issue One features a selection of 1, 2 and 3 page short stories, with Psycho Gran facing off against rampaging kaiju, neo-Nazi skinheads, bag-snatchers, death-row inmates, and people who use their mobile phones in cinemas. The artwork is very good, perfect for the subject matter, but how much pleasure you get from Psycho Gran will completely depend upon your sense of humour. Personally I found it to be very hit or miss. The first strip had me laughing out loud thanks to the unexpected punchline, and several others raised a good chuckle, but equally some vignettes were either predictable or a little too toilet humour for my liking (explosive diarrhea!). So whilst not for everyone, Psycho Gran is pretty much guaranteed to raise a smile or two, and in a world of super serious comic books, that's never a bad thing. Discover all the titles featured in the Best of British month.